Re-Ewes Split Pants are eco-friendly split crotch pants made from recycled wool sweaters. They provide more coverage than L’il Baby Chaps but less than the EC Wear Split Pants. Because they are made from wool, which is insulating by nature, breathable, self-cleaning when lanolized, water repellant, quick drying, and warm even when wet, they can be used with a diaper and are excellent for offering an extra layer of warmth in cold weather. 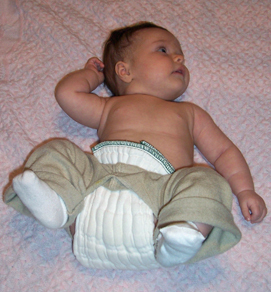 Re-Ewes Split Pants™ are terrific for elimination communication, keeping your baby warm during diaper-free time so baby and caregiver can gain awareness of elimination patterns. 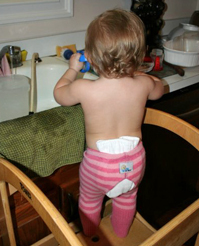 You can tuck a prefold inside, using the waistband as you would use a prefold belt to hold a diaper up. Split pants in this style are great for toddlers wanting independence to potty by themselves who don’t yet know how to take their own pants down- and also great for layering under (or over) a diaper for a younger baby. When your baby needs to use the potty, you can remove the prefold with one quick motion, leaving it in at the front or back and folding it up out of the way of the potty, or remove entirely–whichever is easier for you. Re-Ewes™ are an excellent winter EC clothing solution, providing a warm alternative when you want to do diaper-free time for observing your baby’s elimination patterns or signals, and for using your cue sound (e.g. “pssss”) immediately in response to your child’s elimination. During night-time EC, Re-Ewes™ keep your baby warm and ensure that potty opportunities are quick and easy because you won’t need to undress your baby to remove her diaper and hold her over the potty. Wool is very absorbent and self-cleaning. Re-Ewes™ come lanolized and ready to wear. The pants can be worn several times between washings and hung up to dry as needed. Care is easy: Hand-wash or machine wash on gentle cycle in a lanolin-rich wool wash, roll up in a towel to squeeze the excess moisture out, and lay flat to dry. Made in USA by a seamstress working in her own home of recycled 100% wool sweaters of varying origins exclusively for EC Wear.